I love guiding for salmon. 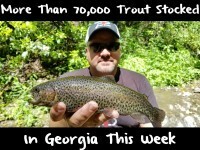 Meanwhile, for the last six years I’ve spent the fall fishing the Motherlode lakes for planted rainbow trout and landlocked king salmon. It’s been fun, but a different kind of excitement from what I was used to doing with my clients between 1998-2006. Prior the 1998, I’d fished the Lower Sacramento River for fun for nearly 20 years. Unfortunately, the salmon fish was so poor the last half-decade that it didn’t warrant any guiding down there. If you guided you weren’t doing your clients any justice. Odds were, you weren’t going to catch much. Thankfully, after a few weeks back guiding in the Delta area I’m singing old tunes. I’m seeing lots of big, bright salmon. It’s been 2006 since I’ve seen anything like this. There are guys waiting in line to clean fish this year and a line to pull your boat out. The salmon run has returned. 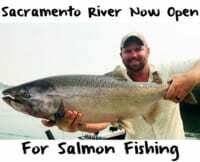 The Sacramento River has hundreds of river miles, but I stay low and fish between Rio Vista and Isleton, basically from Vieira’s Resort, which is on the Sacramento River, to the mouth of the Sacramento River Deepwater Channel. I only troll an area fewer than two miles long, but it’s productive. We still have lots of fresh fish coming through. A lot of people don’t realize that Lower Sacramento is fished much different than the upper stretch. I’m fishing tidal water and I don’t fish eggs. If I did, the water would turn into carp city. The fish down here aren’t into the protective mode yet. They are coming out of San Pablo Bay and the only thing on their mind is getting to their spawning grounds. I don’t think I’ve ever seen anyone use eggs this far down, at least not for salmon. We drag spinners and on plugs. From Antioch to Sacramento the majority of the fish are caught on hardware. Because we have weaker current down here the water is conducive to trolling spinners. Trolling spinners also enables us to cover lots of water and locate aggressive fish. I like fishing the incoming tide. The incoming tide puts less resistance on the salmon as they are moving upriver. I don’t like the outgoing tide. I think the fish hold up during the outgoing tide and wait to migrate more during the incoming tide, but consider this is all speculation. Salmon are bound to prove all of us wrong from time to time. I can only offer my results after logging more than 25 years on the river. On an incoming tide, I like to troll upriver. And, when doing so the most important thing is keeping your spinner close to the bottom. I’m hoping my spinner is always riding about two-feet off the bottom. The salmon remain in the bottom few feet of the water column. I read a lot about guys trolling herring in the river in the Northwest. 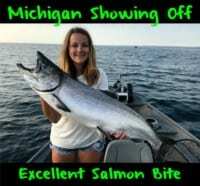 Unfortunately, we can’t do this here because the massive amount of smaller stripers in the Delta would destroy those baits before you can find a salmon. Instead, I troll No. 5 Silvertrons, Mepp’s Flying C’s and No. 5 Blue Fox spinners. These spinners emit flashes and vibrations and irritate salmon enough to get strikes. When I’m not trolling, I’ll switch to plugs. Running plugs, in this area, is best served on an outgoing tide, while trolling downstream. This allows you cover a lot of water, much quicker. The plugs are moving so quickly that you’ll get a true impulse strike. I use sardine wrapped Wiggle Warts, Kwik Fish and Flat Fish and soak all my fillets in Pautzke’s Liquid Krill. It’s important to let the fillets sit overnight in the krill to all for maximum absorption. It’s also important to freshen it up while on the water squirting on more every time you check for weeds, etc.